In the 1920s, they were called the Women’s Olympic Games, a sporting event organized because Baron Pierre de Coubertin fiercely resisted the wholesale addition of women in his Olympic Games. The Second Women’s Olympic Games were held in Gotherberg, Sweden in 1926, in which there was one Japanese representative – Kinue Hitomi . Overnight (figuratively in that age of snail mail and print journalism), Hitomi became a star in Japan. Japan’s flag flew proudly in Sweden thanks to the athletic prowess of the 19-year-old from Okayama Prefecture in Western Japan. At the 1928 Olympic Games in Amsterdam, Japan had high hopes for Hitomi . Unfortunately, the organizers did not include the 200 meter race in its schedule, a sprint that Hitomi believed she had the best chance to win. But due to schedules and other factors, she entered herself in the 100-meter race. And in the semi-finals, Hitomi was eliminated. She missed entering the finals by a fraction of a second and was in serious trouble of returning to Japan with nothing to show for it. As Kietlinski explained, the discus throw had already ended, the high jump was simply too competitive, and the 4X100 relay required three more teammates. As Hitomi began to feel her dreams of becoming Japan’s first female Olympic medalists slip away, she remembered something her coach had told her again and again – to use her arms when her legs were tired. In the grainy video footage of the race, one can actually see the moment at which Hitomi remembers this advice, as her arms suddenly gain power and she begins pumping them higher than eye level. Through her mental and physical exhaustion, Hitomi managed to regain the ground she had lost after the first lap, and in the final straightaway (the last 50-meters of the race) she pulled ahead of several runners to finish second overall in a time of 2 minutes, 17 seconds. This time broke the standing world record for that distance by nearly five seconds. With her silver medal in the 800-meters, Hitomi became Japan’s first female Olympic medalist. And she returned to Japan as a hero. But Hitomi could not escape one perception – she was a women who was unlike other women in her home country. She was taller (169 cm) and heavier (54 kilos) than most women in Japan, and despite how proud the average Japanese was about Hitomi’s accomplishments, they also didn’t mind chuckling about whether she was a man or woman. Kinue Hitomi – as you can see, taller than average. Kietlinski uncovered this interview of Hitomi in a popular women’s magazine, Fujin Sekai. In the excerpt of this July, 1929 article, “Miss Hitomi Kinue and the Question of Womanhood”, Kietlinski highlights what society’s expectations were for women in the 1920s. You must be warned. Even men who give little regard to diversity issues today may find this interview cringe-worthy. Fujin Sekai (FS): Since women’s sports have become popular I have noticed the average height of women has grown somewhat…And may I ask your weight? 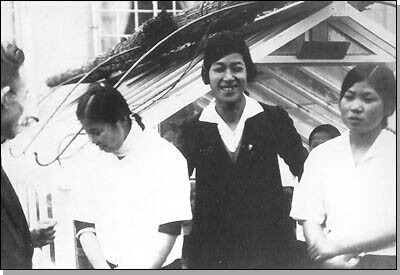 Hitomi Kinue (HK): Fourteen kan, four hundred momme (about 53 or 54 kilograms). FS: Well, that is a bit surprising! So, since that is about the same weight as most men, haven’t people said that they are doubtful that you are really a woman? HK: Well, when I was overseas nobody had such suspicions, but I heard this rumor upon my return to Japan. FS: Ha ha ha! Well wouldn’t that be funny if you were really a man! It has a smack of mystery – this could be the main plot twist if I were to write a mystery novel. It might really baffle people, ha ha ha! FS: The appearance of your body is not really that of a woman, not only are you so suntanned but…. HK: The physique of women in other countries is quite different from that of Japanese women. FS: This may be a bit rude but the shape of your chest and hips really isn’t like normal Japanese women, so it seems like you are more like a Western woman. HK: Well, if you are too fat then you aren’t really fit to do sports. FS: But is it true that if you are just doing sports day in and day out that eventually you will come to be somewhat masculanized? HK: No that is not true…. FS: So are you physically becoming more masculine? HK: Since I exercise a lot, my body perhaps appears more masculine than that of a typical Japanese woman…. FS: Please forgive me for being so rude, but there is a problem I have heard again and again about women’s sports. Is it true that very intense physical activity can cause gynecological abnormalities for women? HK: It does not cause abnormalities. My health is just fine. While there have been cases reported of women collapsing while playing sports because they were on their periods, it was really just because some team sports (like basketball) can get a bit rough at times. I am a track athlete, and have never noticed anything abnormal about my health. FS: When you become a wife and have a family in the future, will you continue to do sports? HK: Yes, I do not expect anything to change. Posted in Gender, Japan, Other Olympics, Track and FIeld and tagged 1928 Amsterdam Olympics, Fujin Sekai, Hitomi Kinue, Japanese Women and Sport, Robin Kietlinski, Women's Olympic Games. Bookmark the permalink. The interview showed very well the thinking and culture of the times, and yet I can remember even in the 60s in the US that when a woman gave her opinion, men would often snicker and say, “Oh, what does she know? She’s a woman.” These kinds of interviews and the rumors going on about Hitomi Kinue must have had their affect on her. — Interesting to note that it took many years for women to have near equality in the Olympic games. I believe it is only in this century that practically half of participants are women. Is there any possibility to see the interview in Japanese? I would be interested to read it if it is available. Thank you. Richard, please send me an email.